I went through a pretty good Joan Lowery Nixon phase when I was about twelve or thereabouts. Along with Lois Duncan, Ms. Nixon kept me well supplied with tense, easily digested mysteries about young girls who encountered the horrifying and the deadly on a regular basis. As I was in the process of expanding a bit on my Nancy Drew addiction, I basically ate them up with a spoon. I collected used copies of most of Nixon's books and, at one point, had quite a group of them on my shelf; now they've been whittled down to the most memorable, sentimental few. Of her mysteries I held on to Secret, Silent Screams, The Kidnapping of Christina Lattimore, and The Dark and Deadly Pool. 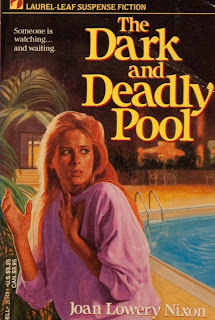 And while the first two are probably better crafted, more complicated tales, The Dark and Deadly Pool is my favorite because of its offbeat and lovable main characters--Mary Elizabeth Rafferty and her friend Fran or, as I like to call him--ManFran. Clutching the health-club keys tightly, I flipped off all the lights as fast as I could, locked the office door, and sprinted toward the door that connected the health club with the hotel. So much for plans. In the darkness I slammed into a body that made an oofing sound and wrapped its arms tightly around me. Down we dropped, legs thrashing. I fell on top of whoever it was, and he let out a yell. "I have a weapon," I said fiercely, wondering where my handbag and key ring had landed. "Don't move, or you're dead." "I hope you move. You're squashing me," he grunted. I recognized his voice. "Fran? What are you doing there?" "You knocked me down." His words came out in gasps. "Get up, Liz! You're heavy, and your elbow is in my stomach!" I quickly rolled away and sat up. Fran sat up too. My eyes were becoming accustomed to the darkness, so I could see Fran rubbing the back of his head. "I'm sorry," I said. "I didn't know you were in the club." "I thought I'd help you close up," he said. "I guessed that you were still a little jumpy." I was really touched. "Fran," I said, "what a nice, kind thing to do." He reached for my hand and held it. His hand was warm and strong. "What kind of weapon?" he asked. "You said you had a weapon. You said if I moved you'd kill me." "Oh," I said. "The health-club keys, but I dropped them along with my handbag." "How do you key somebody to death?" Fran asked. He put an arm around my shoulders and moved closer. "Don't make threats you can't carry out." Without a pause he added, "Very interesting. Your height is in your legs." "You have very long legs," he said, "which look good in shorts. I noticed. But all legs aside, the point I'm trying to make is that when we're sitting down our bodies are the same height. See?" "Oh," I said, "you're right." "So maybe we could meet in a cafe--something elegant, like Flakey Jake's or Showtime Pizza." "Those aren't elegant. They're fast-food restaurants." "Look, I don't have all the money in the world. You'll have to restrain your greedy impulses." "Pay attention. You can be seated, looking lonely and romantic, and I'll come in and sit across from you and take your hand." He just smiled. "See how it works? We can both be sitting down the whole time, and relative heights won't matter." "What about when we leave?" "One of us will just have to leave before the other one." "It will be me," I said. "I'll arise, still looking lonely and romantic, and drift out of your life." "We're losing something here, "he said. "Let me think of another example." Pretty cute, huh? There's something about the taller, stronger girl being courted by the smaller, Puckish boy that appeals to me. Throw in the fact that they run around rather ineptly fighting crime together and you've got yourself a winning combination, my friend. Nothing in the way of surprising or truly deep (except the, uh, pool), but everything in the way of endearing and charming. Every now and then I still pull out my old copy and settle in for a couple hours with Mary Elizabeth and ManFran. And you know what? They're still good company. When I read your post I was thinking, I know I've read one of her works before...then I googled her and saw, "Aha!" I did. I read If You Were a Writer (a kid's picture book about writing) and Who Are You?. I might have read more, but I can't quite remember. I definitely read her when I was just breaking into the young adult section of the library, and I remember just eating them up! Have you read Patricia Brigg's The Hob's Bargain? The heroine literally gets wooed by a puck! Please, I know it's a huge spoiler and all, but can't you just tell us, in the commnets, like, if there was indeed a body in the pool???? please? I totally had the third cover for this book. I think all my JLN books were by that publisher, they all had the upper right hand corner box with the author name. Sharry, I had no idea she'd written writing books for kids! And I have not yet read THE HOB'S BARGAIN. I've been saving those earlier Briggs books for a rainy day and it sounds like it's time to dig in. I've never heard of this author, but I'll have to check them out at the library! I have a retro Friday post of my own today! Vanessa, she's a very nostalgic author for me and if you liked I KNOW WHAT YOU DID LAST SUMMER or something along those lines, I'm sure you'd like her. Charlotte, yay! Thanks for letting me know. I've added you to the list. That is such a wonderful trilogy. I bought the omnibus edition when it came out and my individual copies are ones I collected here and there at used bookstores. It may be time for a re-read. I hadn't heard of Joan Lowery Nixon before. I loved the excerpt you posted. Thanks Charlotte for the RiddleMaster of Hed trilogy shoutout! I have re-re-read that series. I adored The Hob's Bargain. Great blog post, great comments! RKCharron, that's one of my favorite scenes in the book. And I'm a huge fan of the Riddlemaster trilogy. I'm glad you loved The Hob's Bargain. I can't wait to read it now!